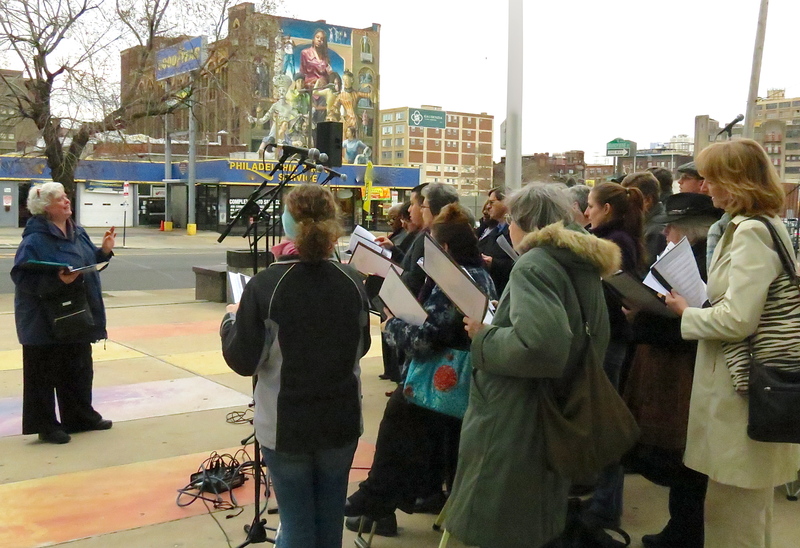 On March 29, Heeding God’s Call, held their Fifth Annual Good Friday Procession and Vigil to protest the continued gun violence in the city. Nearly 200 worshippers gathered late in the afternoon at St. Paul’s Baptist Church, where worship services began, and then “en masse” marched to Benjamin Franklin High School on North Broad Street for the vigil. The Tabernacle United Choir and Arch Street Methodist Choir joined the Healing Presence Singers under the backdrop of the Common Threads Mural, which is representative of hope for the future. Holly Phares directed the choirs during the ecumenical service that included guest speakers from several faith-based organizations and families who have lost children to gun violence. By joining together, the worshipers affirmed that it is possible for citizens to fight for legislation and social policies that would help bring peace to our streets and homes. According to CNN, Philadelphia has one of the worst homicide rates in the country, with more than 80% of these crimes committed with a gun. An average day in US has 30 gun-related murders with another 162 wounded based on the most recent figures from the Centers for Disease Control and Prevention. In addition, 53 people kill themselves with a gun each day. Our homicide rate of 4.7 murders per 100,000 people is one of the highest of all developed countries. Unfortunately, statistics of these daily tragedies mean little in the public consciousness and only when mass shootings occur, do citizens begin to take notice. This outrage that follows these shootings is followed by frustration as law-makers, indebted to the gun lobby, block even the most sensible gun restrictions, such as high-capacity magazines. If the Tucson shooter had only ten bullets, Christina Taylor Green would be with her family today. At the rally in Philadelphia, parents of children who were killed by guns spoke of their loss. While this was a peaceful demonstration, just a day before mothers in Indiana had to stand in defiance in front of a line of armed men carrying AR-15 semi-automatic weapons. The moms, advocating for restrictions on purchases of high-capacity magazines and legislation requiring background checks on gun sales, were protesting in front of the Indiana statehouse. An armed opponent admitted that his rifle was loaded. Some might argue that the Indiana protest was also peaceful, but the potential for violence, either because of accident, mental instability or provocation, undermines the tenants of democracy to live free from the threat of gun violence. Numbers to reach US Senators at this link. Everything we knew about the West we learned from Hollywood’s recreation of the American frontier on television, and we thoroughly absorbed the historical misinformation of the people and culture of that time. By the late 1950s, over thirty westerns, such as Gunsmoke, Have Gun will Travel, Wagon Train, Sugarfoot and Maverick, blazed across the screen. The melodies of the theme songs still replay in my memories. Years later, we learned that what we thought was real about the West was, in fact, myth. As children, we certainly didn’t recognize stereotyping, and we were pretty much oblivious to standardized characters and plot predictability. In looking back, I still reflect with a certain amount of nostalgia just because the television western was a part of my childhood experience. The Lone Ranger became one of our favorite programs. The TV series began in 1949, and new episodes continued through 1957. I remember watching the introductory episode in reruns many times, which unfolded the story of Tonto finding the injured Texas lawman and his transformation into the Lone Ranger. I was not alone in this infatuation, as almost every child in America knew who Kemosobe was. The Lone Ranger and Tonto stood as heroic figures in the lawless frontier. Later I would learn that Jay Silverheels, who played Tonto, resented that he had to speak in a scripted pigeon. As a child, I thought of Tonto as an equal partner with the Lone Ranger, which is surprising given that the Lone Ranger possessed all the hero accoutrements: mask, silver bullets, white hat and horse. To me Tonto acted as a trustworthy and resourceful partner with the Lone Ranger. 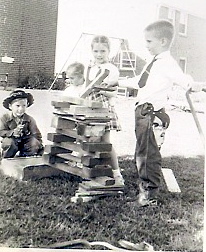 Westerns influenced our childhood games and apparel. The boys in our neighborhood played with toy cap guns. Several regularly wore their cap pistols in holsters and donned cowboy hats. I didn’t like cap guns because my fingers usually got pinched when the hammer mechanism sprung closed to make the “pop” sound. 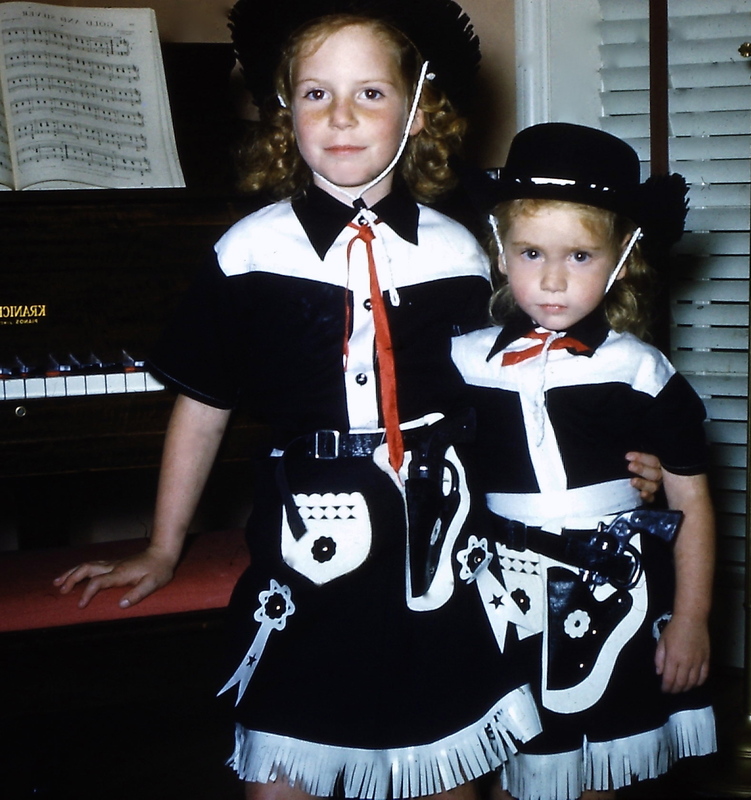 While the boys aimed their guns at each other in mock battles, for us girls, the guns were merely a fashion accessory, part of our cowgirl outfits. I’ve seen many pictures of our friends and relatives from that era, and not many escaped without being photographed in cowboy-girl attire. Our Sally Star dolls even came with holsters and guns, but we never played “shoot outs” with them. 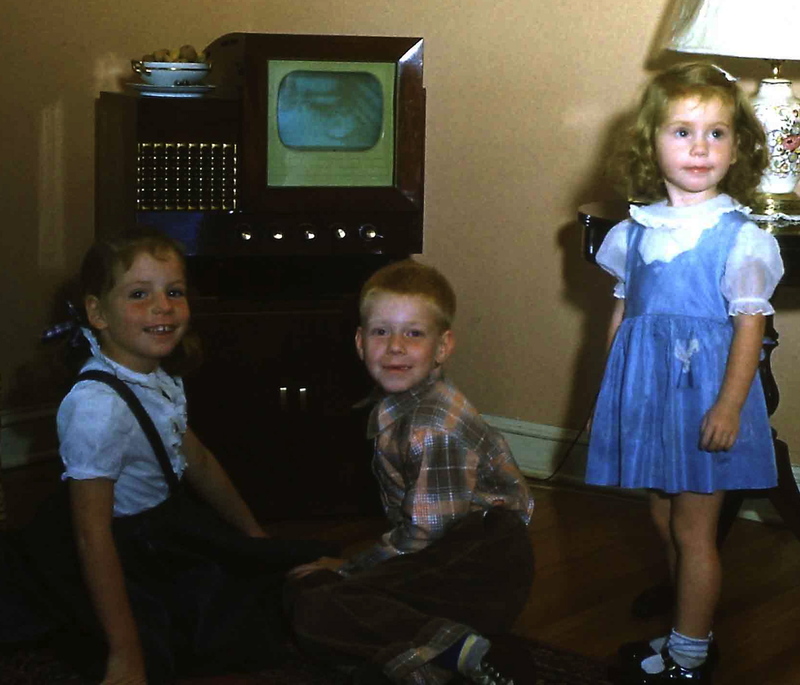 How did I interpret the gun violence on television as a child? Well, I don’t remember either relatives or teachers offering any analysis of the programs or discussions of Western history or violence. Adults purchased the cowboy attire and the toy guns, so I think we assumed these had some legitimacy. At least on the Lone Ranger show, most of the villains never seemed worse for wear for being shot; Hollywood sanitized the effects of gun wounds with an arm in a sling as the typical portrayal of an injury. I think even as a child I realized that TV westerns were pretend–just like our plastic guns. Gun is just part of the outfit. Revisiting some of the episodes offered insight into a comparison of what I remembered from my childhood and the real program content. Now the benefit of scholarly historical analysis uncovers the stereotypical Hollywood interpretation of the Old West and portrayal of Native Americans. In his essay, “I hated Tonto then and I hate him now,” Sherman Alexie writes his views from a Native American perspective about his complicated relationship with Indians in the media. Upon viewing some of the episodes, what immediately struck me was the Lone Ranger’s diction and demeanor. Clayton Moore, the actor who played the Lone Ranger, practiced duplicating the radio voice of the Lone Ranger; his enunciation was impeccable but sometimes comical. “How-dy” came off as a pronouncement rather than a greeting. However, it seemed easy to forgive that overly formal manner as contrasted with so much the gruff and coarse discourse we get today on television; the Lone Ranger was refreshingly polite and well mannered. The program had several other redeeming qualities. This conversation in the first episode revealed an essential tenant of Long Ranger stories: he never shoots to kill but rather only to disarm his opponent, as painlessly as possible. Tonto: Here gun to kill bad men. LR: I’m not going to do any killing. Tonto: You not defend yourself? LR: I’ll shoot if I have to, but I’ll shoot to wound, not to kill. If a man must die, it is up to the law to decide that not the person behind the six-shooter. The Lone Ranger decides to use only silver bullets as a reminder that life is precious. Along those lines, the Lone Ranger usually comes up with a thoughtful plan for dealing with the outlaws. He cautions against rash actions and his plans include deliberately reducing violence. During the series, few story characters trusted the Lone Ranger, because he wore a mask, or Tonto, just because he was an Indian. The Lone Ranger said, “You’ll have to trust me.” That trust contrasted with some of those characters who held respectable positions but who were not always trustworthy, whether doctors, judges or sheriffs. I’m not sure this is the result of watching the program, but I usually don’t ascribe trust to those in power just because of their position or status. The Lone Ranger stories could be characterized as light entertainment that often relied on clichés, such as manifest destiny, the 19th century belief widely held by Americans that the United States, destined to expand across the continent, would bring democracy and rule of law to the world. Manifest destiny rationalized violence, justifiable because of always being on the “right” side; the gun then became a primary symbol of moral violence. Unfortunately, the Lone Ranger was just another vigilante. Shooting to maim was legitimated because neither the legal process nor morality could prevent the violence. The superhero guaranteed and assured the audience that the outlaw will meet his deserved demise. Rather than the legal process, however, violence became the solution to the criminal problem. While representations of violence in the media offer many complexities not easily understood, my theory is that children take on the beliefs of their parents, who are the mediating factors and why it is difficult to arrive at an overreaching theory on how the media influences each child. I wrote about this issue in this post. It seems that generations of young people have accepted the mandate to solve conflicts through defensive gun violence and ignore the concept of the rule of law and reason in their justification of violence. If parents promote vengeance philosophy or celebrate power through weapons, the impact of the media reinforces these views. Although I don’t recall my parents offering any commentary about the westerns, they held firm beliefs against fighting and aggression, which I believe was the greatest influence on my thinking about gun violence. Most of what I watched on television years ago held little sway over my views today. Right there is one of my main arguments against possession of guns: how is justice served if the shooter is the jury, judge and executioner? I guess that’s where the Lone Ranger and I would agree. On Friday evening, December 14, I went to bed with a migraine as I continued to be haunted by the thought of parents grieving for their children killed at the Sandy Hook School. Gazing at my Christmas tree, I thought about the holidays ahead, the gifts that will remained unopened. A tragedy of this magnitude affects all of us. For me, a debilitating headache; for those families, a debilitating heartache. The only thing that cures my emotional overload is taking action. I’ve always been a gun-control advocate; now has to be the time to address the injustice of unregulated gun purchases. One of my friends of Facebook asked: “Those kids, Why little babies?” My response: Because the sale of deadly firearms has been ok with us. But victims of shooting crimes were speaking out that very night against gun violence, and an email from Roxanne Green, whose daughter was killed in the Arizona shooting stated, “I’ve heard a lot of promises from politicians since my daughter was murdered in Tucson, Arizona, including President Obama. But I am still waiting for them to act.” Steven Barton, wrote the same evening of his harrowing experience of being shot during the Batman movie, stating: There was no action taken to make sure that something so horrific never happened again. Washington avoided starting a meaningful dialogue on gun violence, and the costs of that were tragic. Over thirty Americans are murdered with guns every single day. Our broken laws remain ineffective, and our political leaders have been unable to stop gun violence. What can citizens do to mobilize for gun control? Has the “right to bear arms” morphed into an American obsession and addiction? Is an accurate interpretation of the Second Amendment entitle citizens to own guns and is this right absolute? What role has the NRA and other gun lobbyists played in thwarting the “will of the people” to regulate guns, as polls show the Americans support specific policies regulating guns. Why are lobby groups given this power? Does the American health care system support those afflicted with mental disorders? Is there widespread support to help those with mental disabilities and their families? In what places does our system fall short? What specific regulations could be passed immediately that most citizens would support? Would criminalizing verbal threats to life and identifying individuals who display dangerous and violent behaviors, preventing access to firearms be an effective strategy? We are a world community. How do we address war and violence sanctioned by the state? How do we examine our culture to determine how the society encourages violent solutions and reactions? Why not pass laws that make it illegal not to have guns locked and secured and keys unavailable to anyone but the owner with huge fees and penalties for breaking these laws? Why not mandate that gun owners carry mandatory insurance? How does the freedom to own guns impose on the freedom from the dangers that guns bring to the public? How do we educate folks to seek answers to this complex problem. One Facebook response, the tragedy “had nothing to do with fire arms.” Why are segments of the American population in denial about our gun culture? We do know that if the current state of gun regulation remains the same, these shootings will continue to happen over and over and over again. Birthday today . . . my present to myself.